I wish to extend a huge thank-you to the Decatur Baseball coaches, players and parents for supporting my project, Real Stories, Real People. This past Monday evening I was asked to throw out the first pitch. This was both an honor and a humbling experience. My pitch soared sky-high and plopped down short of home plate. As I walked off the mound towards the dugout I was intercepted by one of the graduating seniors with an envelope which contained a very generous donation for my project. Despite my lackluster performance this was an evening that touched my heart and will always be treasured. The game ball sits on my desk, scuffed from bouncing in our red Georgia clay; a reminder of a special evening and a remarkable group of young men. View the full story at http://www.realstoriesrealpeople.org/aaron-and-ryan/. The Stewart Family story embodies all the challenges that families face when caring for a child with a developmental disability. Their story is a complex one for several reasons, one of which is that Pat and Diane are caregivers to two grown sons. Pat and Diane live with emotional, physical and financial challenges that most people cannot even begin to fathom. They have been the sole caregivers to Aaron and Ryan for almost 22 years and have never received any funding for support. 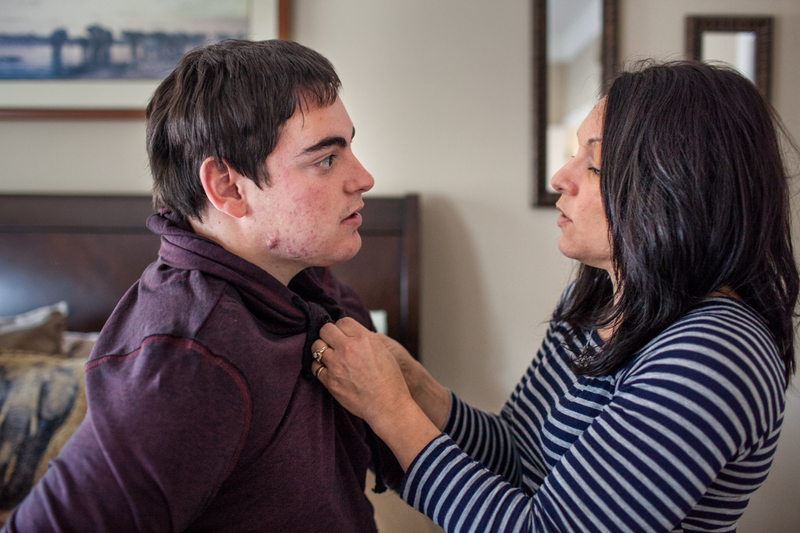 In addition, Aaron is aging out of high school in one month and without support services and a plan in place he is at risk for living a life of isolation. Despite the challenges these parents face, Pat and Diane are not only concerned for the future of their sons but also the future of all persons who are living a with a disability. As Pat and Diane struggle to keep their heads above water they are thinking about ways they can advocate within their community to ensure that all citizens have the opportunity to live meaningful and productive lives. Recently, a friend of mine told me about a remarkable young man, Rickey, whose story is inspirational. I followed up with her lead and met Rickey and his family. As I listened to Rickey’s grandmother talk about the joys and challenges of raising Rickey and his two brothers, I came to the realization that there was more than one story that demanded to be told. This first story is about Rickey. Rickey is 23-years-old and aged out of Eagle’s Landing High in 2012. In his last year of high school he participated in an innovative job training program at the Success Academy. The Success Academy is part of the Henry County School system and offers students with developmental disabilities, ages 18-22, assistance in transitioning from school to work in their community. The Success Academy opened three years ago and has placed 100% of their students in competitive paying jobs each of the last two years. Rickey has a job at the Golden Corral in McDonough, Georgia. 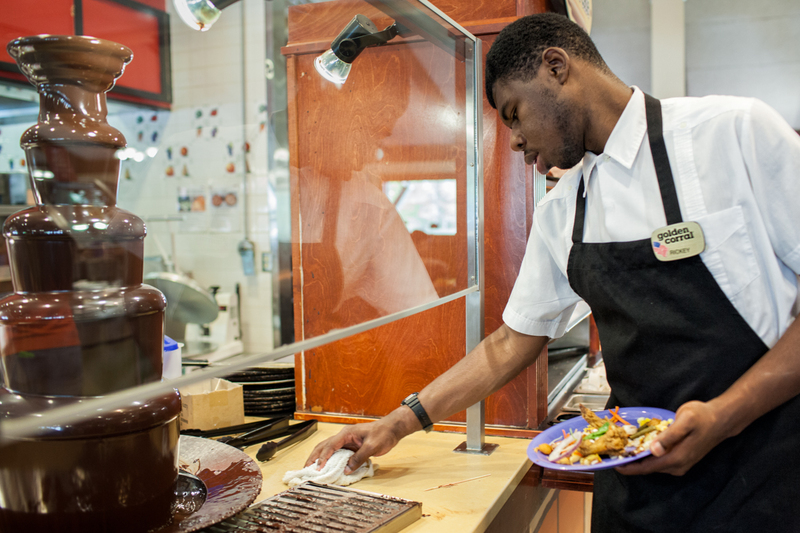 Jon Russell, a psychologist at the Success Academy who was dedicated in placing and supporting Rickey at the Golden Corral, arranged the opportunity for me to observe Rickey working a couple weeks ago; it was a magical experience. The moment Rickey walked into the restaurant he was greeted enthusiastically by his fellow co-workers. The manager approached Rickey with a warm smile and after Rickey slid his apron over his head, the manager tied it behind Rickey’s back. Rickey then proceeded with a ritual he carries out before he clocks in. He zoomed around the restaurant to give his co-workers hugs. Although, the employees were incredibly busy, their faces lit up when they saw Rickey. They immediately stopped what they were doing to say a few works and embraced him in a big bear hug. Rickey then grabbed a snack, an ice-cream cone and plate of fries, before beginning his shift. Once Rickey clocked in I could barely keep up with his pace as he cleaned the buffet tables of stray food, swept the floor and lent a hand wherever it was needed. Rickey worked steadily with an air of confidence and pride and of course a smile on his face. What I witnessed was both remarkable and unremarkable. It was remarkable because 80% of adults with intellectual disabilities are not employed. It was unremarkable because Rickey is a young man who was indistinguishable from all the other employees at Golden Corral. No one would have known that he has had to work extra hard to get where he is and that he has overcome many challenges in his lifetime. He could have been an individual who had languished at home after aging out of high school, but because Rickey is a determined young man and the Success Academy believed that his gifts and strengths would be valued in the workforce, Rickey has a job. Stay tuned to learn about the tour de force behind Rickey, his grandmother, Donna.